Between January 2011 and January 2012, iPhone adoption among lawyers grew from 31 percent to 44 percent. According to attorney Jeff Richardson who has written about the 2012 American Bar Association (ABA) Legal Technology Report, “if an attorney is using a smartphone, there is about a 50-50 chance that he or she is using an iPhone.” With the iPhone 5 launch earlier this month, anticipate iPhone adoption to continuing growing. Last year, the 2011 ABA Legal Technology Report revealed 13 percent of attorneys were using their iPads for work-related tasks. By January 2012, this number more than doubled with 33% using a tablet device for law-related tasks, and 91% reported iPad as their tablet of choice. Remember, that number is based on reports before the iPad 3 hit the market. Research on iPad use that was reported in April 2012 shows a dramatic jump in iPad use for business-related tasks after the release of the iPad 3. With compelling data showing the rapid adoption of iPhones and iPads in law practices, it was helpful that the 2012 American Bar Association Annual Meeting offered a session entitled: “Developing Your iPractice: How Lawyers are using the iPhone and iPad.” I had the opportunity to attend this session and meet the presenters: Tom Mighell, Esq. and Paul Unger, Esq. iPad Gurus Tom Mighell, Esq. and Paul Unger, Esq. Tom Mighell is a Senior Consultant with Contoural, Inc. where he provides management and e-discovery services to companies. Prior to becoming a consultant, Tom was a litigator for 18 years in Dallas, Texas. He is a frequent speaker and writer on legal technology, and is the author of iPad Apps in One Hour for Lawyers, iPad in One Hour for Lawyers and the upcoming book iPad Apps for Litigators. He just completed his term as Chair of the ABA Law Practice Management Section. 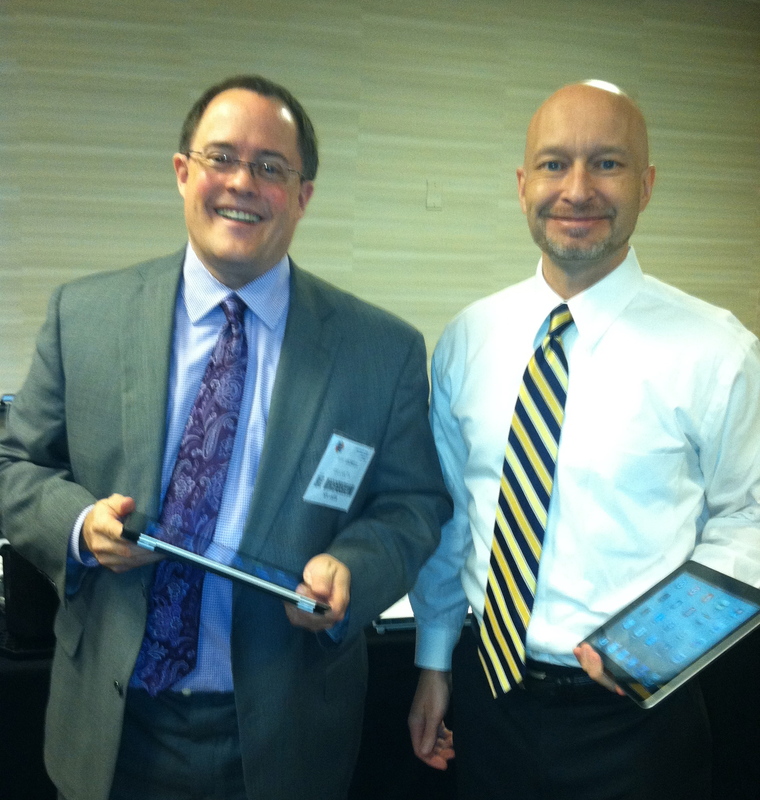 He publishes two blogs: a legal tech blog at Inter Alia and an iPad for lawyers blog at iPad 4 Lawyers. Paul Unger is an attorney and founding principal of Affinity Consulting Group, a nationwide consulting company providing legal technology consulting, training and continuing legal education. He specializes in trial presentation and litigation technology consulting, document and case management software, paperless office strategies, and legal-specific software training for law firms and legal departments throughout the Midwest. Mr. Unger was the chair of the 2011 ABA Tech Show, is an adjunct professor for Capital University Law School’s Paralegal Program, and is a national speaker and frequent CLE lecturer. 16. iPad in court tip: Have a good back-up plan including extra charging cables and, if possible, even an extra iPad loaded and ready to go. 15. Dropbox is a great cloud-based file management system with a helpful folder structure to keep your materials organized. It is easy to use and works seamlessly with many other popular productivity apps. 14. Dropbox tip: Hit the star button in the upper-right hand corner to save a resident local copy of whatever file you have open when you tap the star. 13. When scrolling through a long list, tap the very top center tool bar to bring you quickly back to the top of a list without having to manually scroll. 12. Dictamus is an app that records an audio file and then emails it to a virtual assistant or to Dropbox. This app time/date stamps the file and sends it in a compressed format back to the office. Dictamus also has the capability to import files into a transcription service. 11. Passcode and password tips: Your passcode is a simple four-digit code to protect the data on your device. For security purposes, set your auto lock to a short amount of time before the passcode is needed. For general passwords: set your various passwords to the new recommend length of 12 characters or more. 8. Teleprompt+ lets you read along and use your iPad built-in camera to YouTube or video pod cast. Tip: Practice first so your eyes are not tracking while you read. 6. The Split On-screen keyboard creates two sections to the keyboard, allowing for easier typing with your thumbs (if you like) while viewing more of the screen. Someone sitting near me exclaimed: “Never knew you can do that! Cool!” Here is a youtube video demonstrating how to use and move the on-screen keyboard. 4. Noteshelf has many hand-writing features, a zoom, organizes your notes on a shelf, and saves your notebooks as PDF files to export to Evernote or Dropbox. Noteshelf is Tom’s top note-taking app. 3. Notability let’s you maintain notebooks, embed photos, write with stylus, draw, type, audio record, annotate PDFs and Dropbox sync. Notability is Paul’s top note-taking app. 1. Mr. Reader is a news aggregator and Tom Mighell’s favorite app. Mr. Reader plugs into Google reader subscriptions and let’s you share and save news to either Instapaper or Evernote. Among the highlights for me during this session, in addition to meeting Tom and Paul, was connecting with solo attorney Heather Hale who is now a contributor to LITIG8R TECH, sharing her passion for developing an iPractice. If you have an opportunity to hear Tom (Twitter @TomMighell) or Paul (Twitter @PaulJUnger), you should take it. Un-billable time well spent. This is a great article. The Split On-screen keyboard tip is one that I have relied on for some time. I’m sure many people benefited from this article. So glad you enjoyed the article Scott!